git commit -m "Adding build specification." This is a guest post from my colleagues Naveen Swamy and Joseph Spisak. Machine learning is a field of computer science that enables computers to learn without being explicitly programmed. It focuses on algorithms that can learn from and make predictions on data. Most recently, one branch of machine learning, called deep learning, has been deployed successfully in production with higher accuracy than traditional techniques, enabling capabilities such as speech recognition, image recognition, and video analytics. This higher accuracy comes, however, at the cost of significantly higher compute requirements for training these deep models. One of the major reasons for this rebirth and rapid progress is the availability and democratization of cloud-scale computing. Training state-of-the-art deep neural networks can be time-consuming, with larger networks like ResidualNet taking several days to weeks to train, even on the latest GPU hardware. Because of this, a scale-out approach is required. Enabling faster iterative research, allowing scientists to push the state of the art faster in domains such as computer vision or speech recognition. Reducing the time-to-market for intelligent applications, allowing AI applications that consume trained, deep learning models to access newer models faster. Absorbing new data faster, helping to keep deep learning models current. 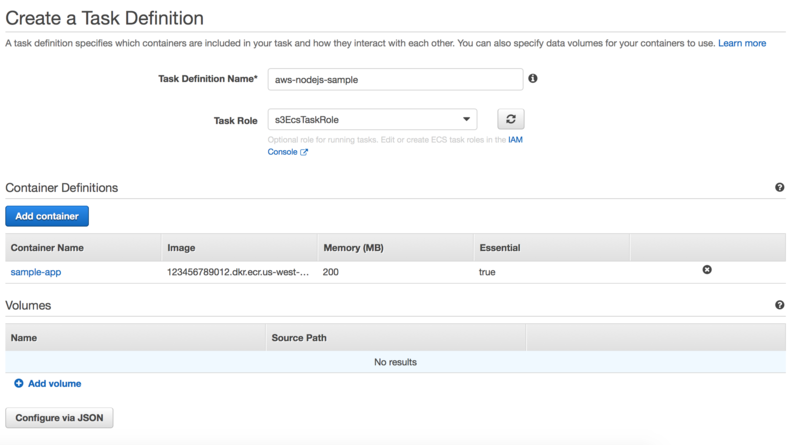 AWS CloudFormation, which creates and configures Amazon Web Services resources with a template, simplifies the process of setting up a distributed deep learning cluster. The CloudFormation Deep Learning template uses the Amazon Deep Learning AMI (supporting MXNet, TensorFlow, Caffe, Theano, Torch, and CNTK frameworks) to launch a cluster of Amazon EC2 instances and other AWS resources needed to perform distributed deep learning. CloudFormation creates all resources in the customer account. A VPC in the customer account. The requested number of worker instances in an Auto Scaling group within the VPC. These worker instances are launched in a private subnet. A master instance in a separate Auto Scaling group that acts as a proxy to enable connectivity to the cluster via SSH. CloudFormation places this instance within the VPC and connects it to both the public and private subnets. This instance has both public IP addresses and DNS. A security group that allows external SSH access to the master instance. Two security groups that open ports on the private subnet for communication between the master and workers. An IAM role that allows users to access and query Auto Scaling groups and the private IP addresses of the EC2 instances. A NAT gateway used by the instances within the VPC to talk to the outside world. The startup script enables SSH forwarding on all hosts. Enabling SSH is essential because frameworks such as MXNet makes use of SSH for communication between master and worker instances during distributed training. The startup script queries the private IP addresses of all the hosts in the stack, appends the IP address and worker alias to /etc/hosts, and writes the list of worker aliases to /opt/deeplearning/workers. Note: To scale to the desired number of instances beyond the default limit, file a support request. Download the Deep Learning template from the MXNet GitHub repo. 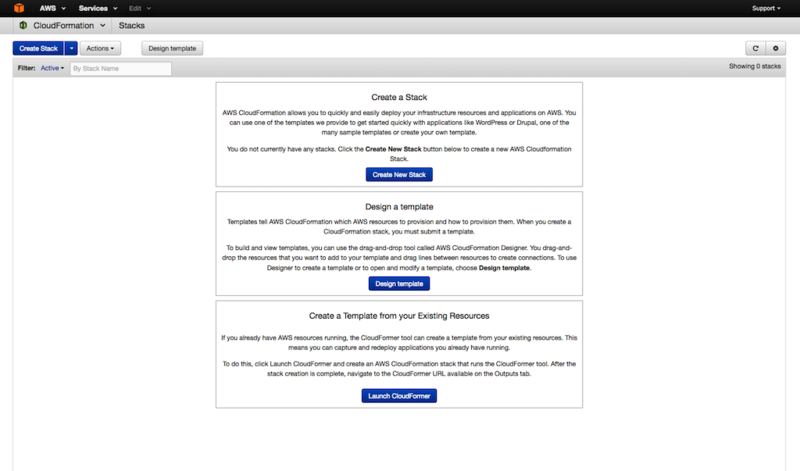 Open the CloudFormation console, and then choose Create New Stack. For Stack name, enter a descriptive stack name. Choose a GPU InstanceType, such as a P2.16xlarge. For KeyName, choose an EC2 key pair. For SSHLocation, choose a valid CIDR IP address range to allow SSH access to the master instance and stack. For Worker Count, type a value. The stack provisions the worker count + 1, with the additional instance acting as the master. The master also participates in the training/evaluation. Choose Next. (Optional) Under Tags, type values for Key and Value. This allows you to assign metadata to your resources. (Optional) Under Permissions, you can choose the IAM role that CloudFormation uses to create the stack. Choose Next. 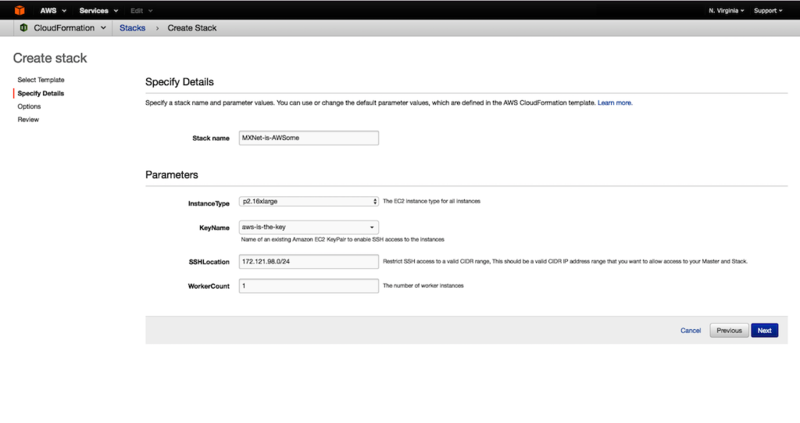 Under Capabilities, select the checkbox to agree to allow CloudFormation to create an IAM role. An IAM role is required for correctly setting up a stack. To see the status of your stack, choose Events. If stack creation fails, for example, because of an access issue or an unsupported number of workers, troubleshoot the issue. 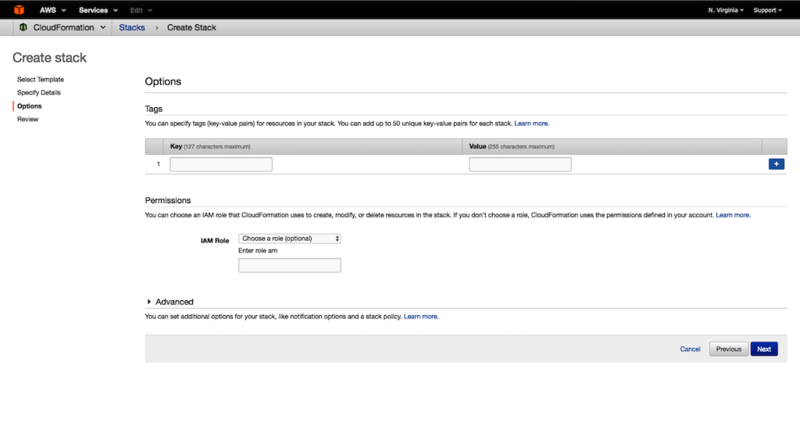 For information about troubleshooting the creation of stacks, see Troubleshooting AWS CloudFormation. The event log records the reason for failure. Log in to the master instance. SSH agent forwarding securely connects the instances within the VPC that is connected to the private subnet. 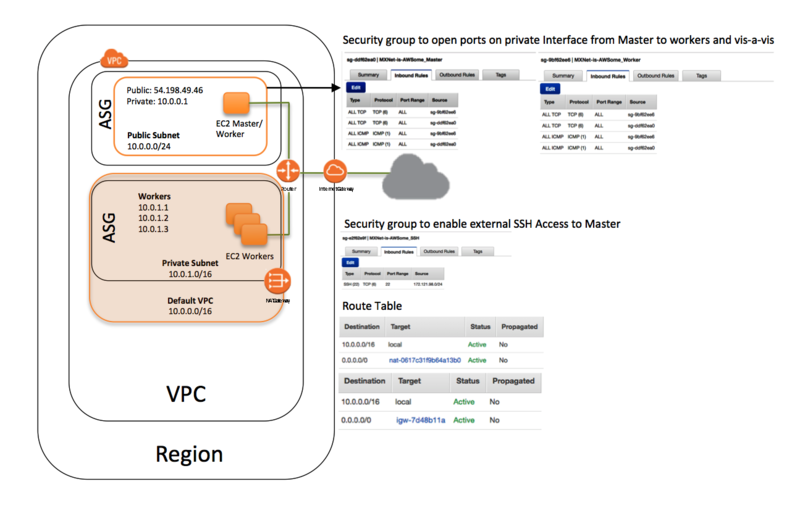 The idea is based on Securely Connect to Linux Instances Running in a Private Amazon VPC. Find the public DNS/IP of the master. The CloudFormation stack output contains the Auto Scaling group in which the master instance is launched. Note the Auto Scaling group ID for MasterAutoScalingGroup. On the Auto Scaling page, search for the group ID and select it. 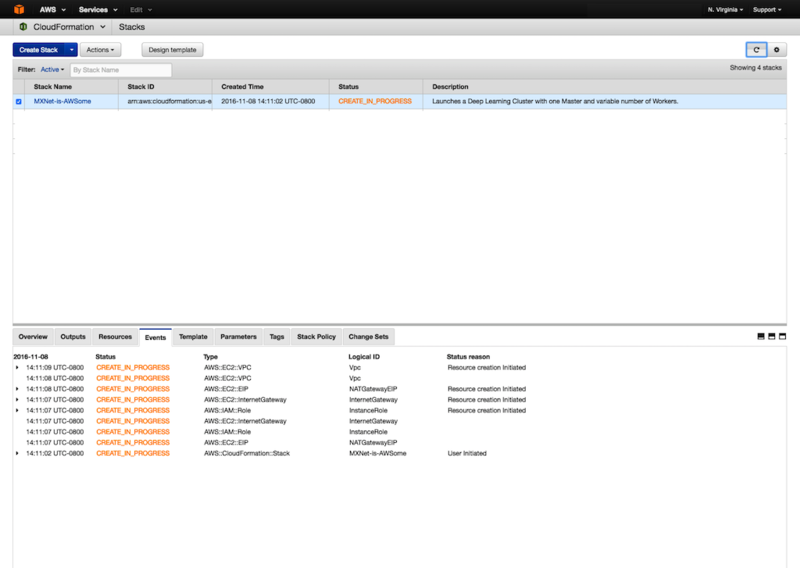 On the Instances tab, find the instance ID of the master instance. Choose the instance to find the public DNS/IP address used for login. These steps are only a subset. For more information about running distributed training, see Run MXNet on Multiple Devices. 1. How do I change the IP addresses that are allowed to SSH to the master instance? The CloudFormation stack output contains the security group that controls the inbound IP addresses for SSH access to the master instance. Use this security group to change your inbound IP addresses. 2. When an instance is replaced, are the IP addresses of the instances updated? No. You must update IP addresses manually. 3. Does the master instance participate in training/validation? Yes. Because most deep learning tasks involve GPUs, the master instance acts both as a proxy and as a distributed training/validation instance. 4. Why are the instances in an Auto Scaling group? Auto Scaling group maintains the number of desired instances by launching a new instance if an existing instance fails. There are two Auto Scaling groups: one for the master and one for the workers in the private subnet. Because only the master instance has a public endpoint to access the hosts in the stack, if the master instance becomes unavailable, you can terminate it and the associated Auto Scaling group automatically launches a new master instance with a new public endpoint. 5. When a new worker instance is added or an existing instance replaced, does CloudFormation update the IP addresses on the master instance? No, this template does not have the capability to automatically update the IP address of the replacement instance. This is a guest post from my colleague Asif Khan. Federation is a mechanism to connect identity management systems together. A user’s credentials are always stored with the “home” organization (the identity provider). A service provider trusts the identity provider to validate credentials when the user logs into a service. The user never provides credentials directly to anybody but the identity provider. Many of our customers use federation to manage secure access to systems and user stores and have expressed a requirement to use federation with Amazon ECR, and this post explains how to do that. With Amazon EC2 Container Registry (Amazon ECR), customers can store their Docker images in highly available repositories managed by AWS. ECR encrypts images at rest using server-side encryption managed by Amazon S3, and also provides integration with AWS Identity and Access Management (IAM) to control who can access a given repository. Amazon ECR makes it easy to set up repository policies that grant push/pull access to IAM users, roles, or other AWS accounts. In order to push and pull images to an ECR repository using the standard Docker commands, customers must first authenticate with ECR by obtaining an encrypted token to pass in the docker login command. The token is generated for the AWS identity (IAM user, group, role, etc.) that originally requested the token. However, many customers might already have an identity store outside AWS that they would like to use to authenticate with ECR. With IAM identity federation support, customers can benefit from the standardization on a protocol such as SAML, security control, and an improved user experience. Developers can use their corporate SAML identity provider to log in and use ECR seamlessly. IAM provides an integration with a variety of SAML providers such as Auth0, Bitium and Okta Ping Identity, among others. For a full list, see Integrating Third-Party SAML Solution Providers with AWS. Customers can also choose to implement federation and control access issuing tokens themselves which can be used with the docker login command. With IAM federation, we can set up federation to other identity providers listed. After federation is set up, developers or hosts can use AssumeRole, be granted tokens from the customer identity provider (IDP), and switch to a role which has permission to access the ECR repository. Set up federation between an identity provider and IAM. Set up a role and configure it for federation. Set up user permissions to assume the role. 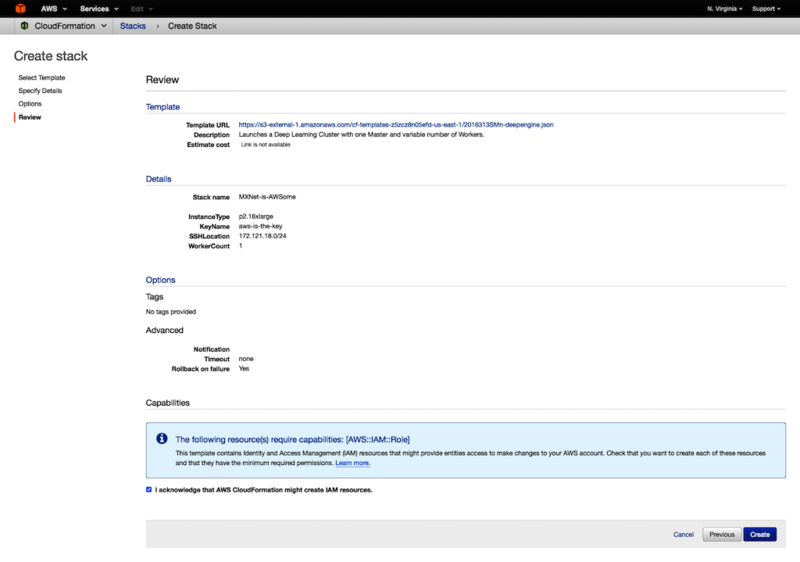 Set up ECR permissions to allow access to the repository. Use the temporary AWS credentials returned by assumeRole when calling aws ecr get-login to obtain the docker auth token. Push and pull from an ECR repository using the Docker commands. Follow the steps in the following topic to set up federation against an identity provider of your choice: Integrating Third-Party SAML Solution Providers with AWS. This walkthrough uses Auth0 as an example. Next, register an app on Auth0 or your IDP. In the IAM console, set up the identity provider on AWS. Next, create a role with read-only access to assume. Note the role name for later. To switch to a role using the AWS CLI, follow the steps in Switching to an IAM Role (AWS Command Line Interface) and grant permissions to switch roles to the role that you created in the previous step. With ECR, you can use the permissions tool to restrict access to selected principals. Choose the previously-created role “TestSAML” as the principal in the permissions. When you run microservices on Amazon ECS, you can pull images from Amazon ECR securely using federation and your identity provider. Federation includes benefits such as standardization on SAML, enhanced security, and an improved user experience. Use this walkthrough with any other identity provider, and achieve the same results. This is a guest post from my colleagues Ryosuke Iwanaga and Prahlad Rao. Developers building and managing microservices and containerized applications using Docker containers require a secure, scalable repository to store and manage Docker images. In order to securely access the repository, proper authentication from the Docker client to the repository is important, but re-authenticating or refreshing authentication token every few hours often can be cumbersome. 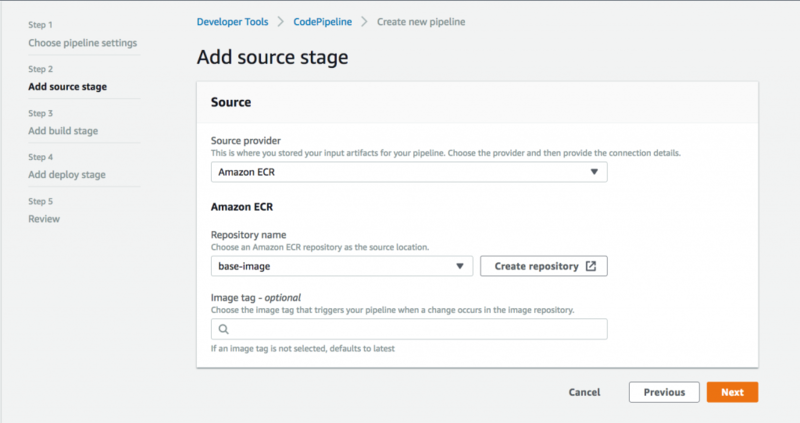 This post walks you through a quick overview of Amazon ECR and how deploying Amazon ECR Docker Credential Helper can automate authentication token refresh on Docker push/pull requests. Amazon ECS is a highly scalable, fast container management service that makes it easy to run and manage Docker containers on a cluster of Amazon EC2 instances and eliminates the need to operate your own cluster management or worry about scaling management infrastructure. In order to reliably store Docker images on AWS, ECR provides a managed Docker registry service that is secure, scalable, and reliable. ECR is a private Docker repository with resource-based permissions using IAM so that users or EC2 instances can access repositories and images through the Docker CLI to push, pull, and manage images. Most commonly, developers use Docker CLI to push and pull images or automate as part of a CI/CD workflow. Because Docker CLI does not support standard AWS authentication methods, client authentication must be handled so that ECR knows who is requesting to push or pull an image. This can be done with a docker login command to authenticate to an ECR registry that provides an authorization token valid for 12 hours. One of the reasons for the 12-hour validity and subsequent necessary token refresh is that the Docker credentials are stored in a plain-text file and can be accessed if the system is compromised, which essentially gives access to the images. Authenticating every 12 hours ensures appropriate token rotation to protect against misuse. To access other account registries, use the -registry-ids <aws_account_id> option. As you can see, the resulting output is a docker login command that you can use to authenticate your Docker client to your ECR registry. The generated token is valid for 12 hours, which means developers running and managing container images have to re-authenticate every 12 hours manually, or script it to generate a new token, which can be somewhat cumbersome in a CI/CD environment. For example if you’re using Jenkins to build and push docker images to ECR, you have to set up Jenkins instances to re-authenticate using get-login to ECR every 12 hours. If you want a programmatic approach, you can use GetAuthorizationToken from the AWS SDK to fetch credentials for Docker. GetAuthorizationToken returns an authorization token of a base64-encoded string that can be decoded into username and password with “AWS” as username and temporary token as password. It’s important to note that when executing docker login commands, the command string can be visible by other users on the system in a process list, e.g., ps –e, meaning other users can view authentication credentials to gain push and pull access to repositories. To avoid this, you can interactively log in by omitting the –p password option and enter password only when prompted. Overall, this may add additional overhead in a continuous development environment where developers need to worry about re-authentication every few hours. This is where Amazon ECR Docker Credential Helper makes it easy for developers to use ECR without the need to use docker login or write logic to refresh tokens and provide transparent access to ECR repositories. Credential Helper helps developers in a continuous development environment to automate the authentication process to ECR repositories without having to regenerate tokens every 12 hours. In addition, Credential Helper also provides token caching under the hood so you don’t have to worry about getting throttled or writing additional logic. You can access Credential Helper in the amazon-ecr-credential-helper GitHub repository. First, build a binary for your client machine. Although you can do it with your own Go environment, we also provide a way to build it inside a Docker container without installing Go by yourself. To build by container, just type make docker on the root directory of the repository. It will run a container FROM go image and build the binary on the mounted volume. After that, you can see it at /bin/local/docker-credential-ecr-login. Note: You need to run this with the local Docker engine as the remote Docker Engine can’t mount your local volume. With these commands, Go builds the binary for the target OS inside the Linux container. Now, you can use the docker command to interact with ECR without docker login. When you type docker push/pull YOUR_ECR_IMAGE_ID, Credential Helper is called and communicates with the ECR endpoint to get the Docker credentials. Because it automatically detects the proper region from the image ID, you don’t have to worry about it. One of the common customer deployment patterns with ECS and ECR is integrating with existing CI/CD tools like Jenkins. Using Credential Helper, your Docker CI/CD setup with Jenkins is much simpler and more reliable. Ensure that your Jenkins instance has the proper AWS credentials to pull/push with your ECR repository. These can be in the form of environment variables, a shared credential file, or an instance profile. Place docker-credential-ecr-login binary at one of directories in $PATH. Write the Docker configuration file under the home directory of the Jenkins user, for example, /var/lib/jenkins/.docker/config.json. Install the Docker Build and Publish plugin and make sure that the jenkins user can contact the Docker daemon. Now Jenkins can push/pull images to the ECR registry without needing to refresh tokens, just like your previous Docker CLI experience. The Amazon ECR Docker Credential Helper provides a very efficient way to access ECR repositories. It is transparent so that you no longer need to recall this helper after setup. This tool is hosted on GitHub and we welcome your feedback and pull requests. At Capital One, we are rapidly embracing cloud-native microservices architectures and applying them to both existing and new workloads. To advance microservices adoption, increase efficiencies of cloud resources and decouple application layer from the underlying infrastructure, we are starting to use Docker to containerize the workloads and Amazon EC2 Container Service (Amazon ECS) to manage them. The Application Load Balancer also introduces path-based routing. This feature allows us to easily map different URL paths to different services. In a traditional monolithic application, URL paths are often used to denote different parts of the application, for example, http://.com/service1 and http://.com/service2. 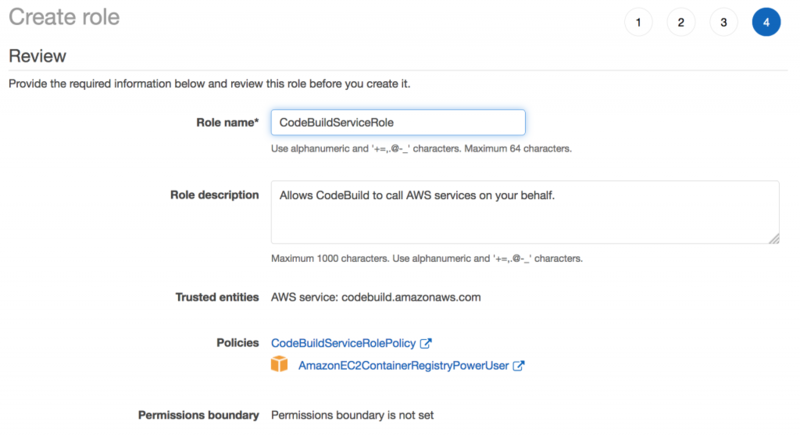 In Amazon ECS, you have always had the benefit of being able to use IAM roles for Amazon EC2 in order to simplify API requests from your containers. This also allows you to follow AWS best practices by not storing your AWS credentials in your code or configuration files, as well as providing benefits such as automatic key rotation. For example, roles let you build systems for secret management using ECS and Amazon S3, use Amazon DynamoDB for state management, or use S3 to store artifacts generated or used by your containers, all without having to deal with AWS credentials in your code. Previously, you had to use IAM roles for Amazon EC2, meaning the IAM policies you assigned to the EC2 instances in your ECS cluster had to contain all the IAM policies for the tasks performed within the same cluster. This means that if you had one container that needed access to a specific S3 bucket and another container that needed access to a DynamoDB table, you had to assign both IAM permissions to the same EC2 instance. With the introduction of the newly-launched IAM roles for ECS tasks, you can now secure your infrastructure further by assigning an IAM role directly to the ECS task rather than to the EC2 container instance. This way, you can have one task that uses a specific IAM role for access to S3 and one task that uses an IAM role to access a DynamoDB table. This feature also allows you to use a minimal IAM policy for the ECS cluster instances because you only need to give the tasks a few required IAM permissions to interact with the ECS service. This post walks you through setting up a task IAM role. 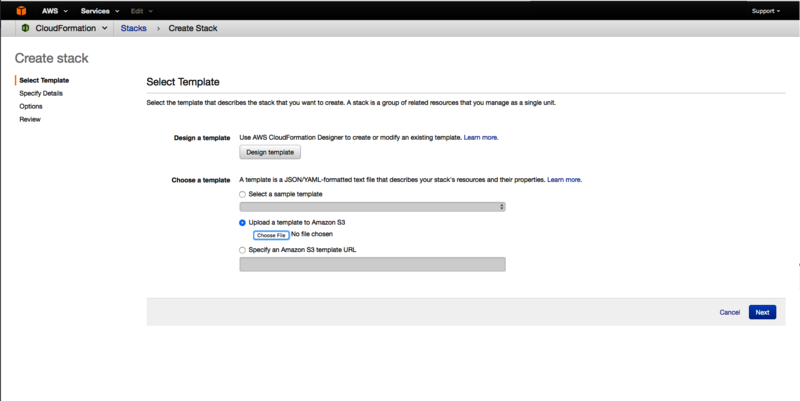 If you haven’t yet done so, create an ECS cluster and launch at least one EC2 instance in the cluster. When you launch your EC2 instances, for the Container instance IAM role, choose an IAM role that has the AmazonEC2ContainerServiceforEC2Role policy attached to it. If you have an existing cluster, use the ECS Optimized AMI 2016.03.e and the SDK released on July 13, 2016 or later to access this feature. For this walkthrough, you use a simple Node.js application that creates an Amazon S3 bucket and uploads a ‘Hello World’ file. You can find the source code for the application on the aws-nodejs-sample GitHub repository. This creates a directory named aws-nodejs-sample in your current directory that contains the code for the sample app. In the same directory, create a Dockerfile file, paste the following text into it, and save it. Create a repository on Amazon ECR named aws-nodejs-sample to store your image. Run the following commands to build and push your Docker image to your ECR repository, making sure to replace the AWS region and account ID with appropriate values. 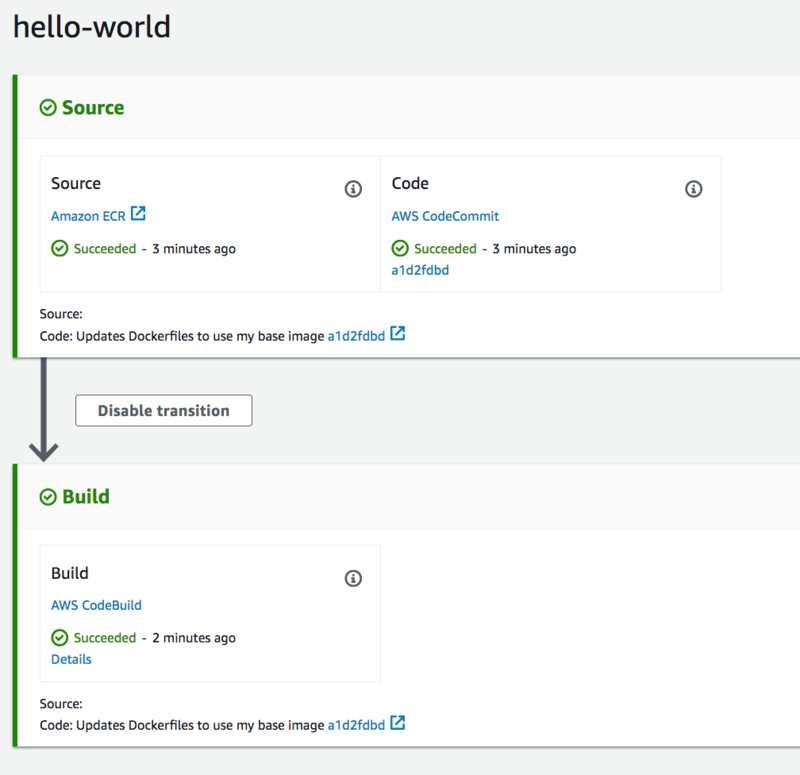 $ docker build -t aws-nodejs-sample . Create an IAM role for your task. For AWS Service Roles, choose Amazon EC2 Container Service Task Role and on the Attach Policy screen, choose the AmazonS3FullAccess IAM managed policy. Create a task definition for the sample app. Switch to the JSON builder by choosing Configure via JSON and paste in the following text, making sure to replace the AWS region and account ID with appropriate values. For Task Role, select the IAM role that you created before and choose Create to create the task definition. 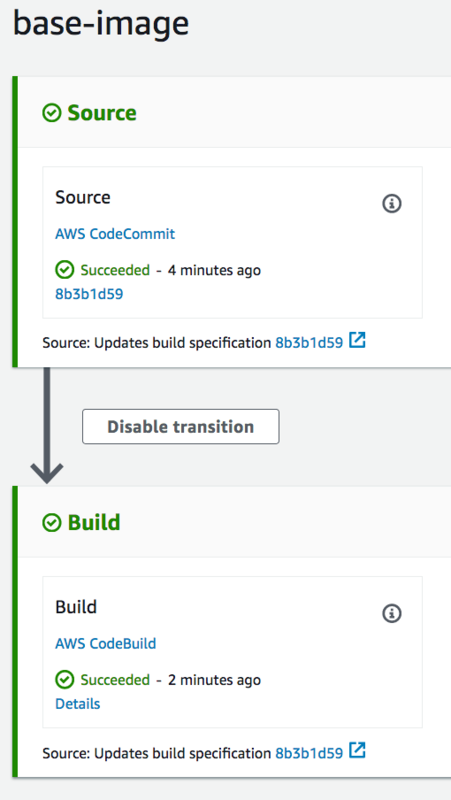 On the Task Definition page, select the revision you just created e.g., aws-nodejs-sample:1 and choose Actions, Run Task. Select your ECS cluster from the list and choose Run Task on the next screen to launch a task on your ECS cluster. Open the Amazon S3 console and verify that a bucket has been created and that it contains the hello_world.txt file. The bucket name is in the node-sdk-sample-UUID format. Note: To avoid unexpected charges, make sure to empty and delete the S3 bucket and to terminate the EC2 instances created in the example above. As you learned in the example above, it is easy to follow AWS best practices around IAM usage and only provide the least needed privileges to a task; thereby minimizing the risk of other tasks accessing data that they are not intended to access. This also simplifies ECS cluster management, as you now have more freedom in bundling your tasks together on the same cluster instances. Keep in mind that you still need to handle security groups on a per-instance basis but you can now be very granular when creating and assigning IAM policies.